I am consistently overwhelmed by the number of talented designers out there just waiting to be shared and uncovered, which is why I’ve decided to introduce a new series of posts on Friend in Fashion, entitled: Fashion Finds. My picks of the emerging designers, destined for great things and to keep an eye out for. This week I'd like to share with you the delightfully feminine Fabled & True (F&T). Characterised by sweet floral prints and delicate lace detailing, F&T, as best put by the designer herself, is a sweet little label made for girly girls. Each collection is made from either vintage or repurposed fabric, which guarantees that you will be one of only a handful toting F&T’s beautiful pieces. 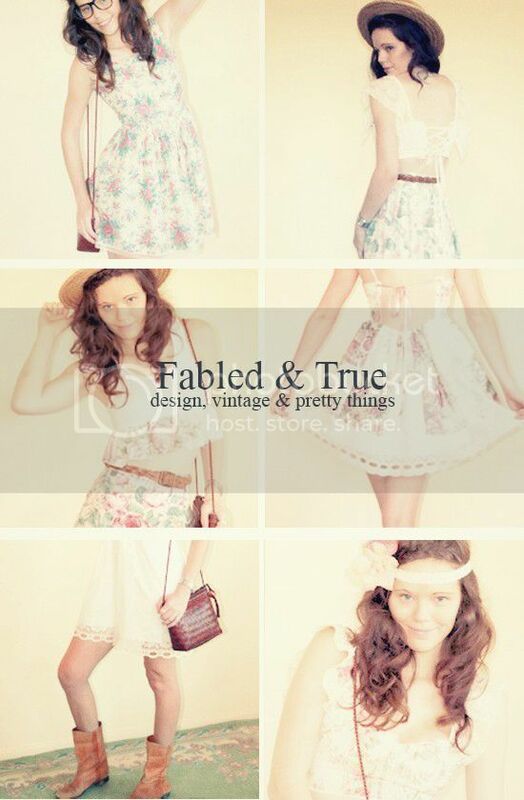 Designed and hand-made in Australia, shipped everywhere in the world, Fabled & True is sure to delight! What’s more, this weekend, Friday 4 January – Sunday 6 January, F&T is offering you 30% off everything in store!